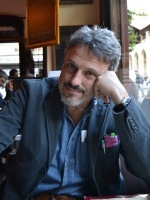 Vittorio Emanuele Parsi is professor of International Relations at Università Cattolica del Sacro Cuore. From 2013 he is Director of ASERI (Graduate School of Economics and International Relations). From 2005 he is Program Director of the Master's course in Economics and International Policies (result of a joint venture between ASERI and Università della Svizzera italiana). Prof. Parsi held seminars and lectures in several universities: University of Bologna, University of Milan, University of Macerata, Princeton University, Georgetown University (Washington, D.C.), Cornell University (Ithaca, N.Y.), Catholic University of America (Washington, D.C.), St. Anthony College (University of Oxford), Université de Saint-Joseph (Beirut, Lebanon), Royal University of Phnom-Penh (Cambodia), Novosibirsk State University (Russia), Kazakh Law Academy (Kazakhstan). He is columnist for "Il Sole 24 ore". From 2008 to 2012 he has been columnist for the national newspaper "La Stampa". From 1999 he is being columnist of International Politics for the national newspaper "Avvenire". Prof. Parsi writes also for "Ideazione", "Italiani Europei", "Diritto e Libertà", "Vita e Pensiero", "Tempi", "Limes", and "Teoria Politica". He plays as "Centre" in the "Veteran Team" of Rugby Monza and is member of the Italian Navy Reserve, with the rank of "Commander".